AutoSplitter has a very sophisticated and well rounded photo detection. 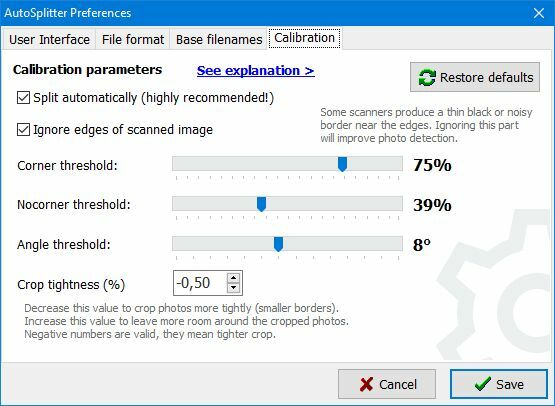 If it fails to find the images too often, you can adjust the parameters described below, but for best results choose the correct processing method for your situation. Please see this scanning guide to find out how you should proceed. You can find a set of parameters governing scan recognition under Options/Calibration/Finetune detection parameters. Corner Threshold & NoCorner Threshold: these work together. AutoSplitter tries to detect the corners of the photos. These parameters in unison control how sensitive the corner detection is. Basically if you increase the corner threshold and decrease nocorner threshold, you make the corner detection more strict. Less false positive detections will happen, but also false negatives will increase. There has to be at least 20% gap between these parameters at all time, otherwise detection will not work well. The gap is enforced by the software, don't worry about it. If your scanner's backlighting is very even all through the page, you may get better results with a lower nocorner threshold. Angle threshold: photos more skewed than this angle are ignored. This helps to eliminate false positive detections. Auto expand: Some people prefer to have a bit of background around their photos, some prefer to cut off a bit of the edges of the photo to make sure the background is not visible. You can set this up here. Positive values to include more of the background, negative to cut off edges. Ignore edges...: Some scanners produce blurry or blackened areas around the edges of the scanning area. Enable this setting to make the autodetection algorithm ignore edges. This will improve detection accuracy in some cases. Everything can vary with each scanner and each scan, unfortunately. If most of your photos are detected, your parameters are probably right. The parameters below have been removed during development, but some older versions still have them, therefore see their description for reference. Background threshold: everytime a new detection is made, the program first separates background from foreground (photos). The bigger this threshold is, the less sensitive the separation is. Lowering this may result in more accurate detections IF the scanner's output is noise free. Most scanners are a bit noisy and/or unevenly lit, therefore we need to have a higher threshold in this variable most of the time. Background color: this is the background color that was used to detect the latest batch of photos. It is automatically detected. This will be overwritten each time when a new detection happens. Use entropy mapping: entropy mapping is a different method of separating photos from the background. May or may not work better than the default method. If you enable this, you can also set a threshold for it, which works in a similar way as background threshold. This is much slower than the default method, but it can improve detection for photos that have lots of background color areas (typically lots of white areas). Entropy mapping will result in lots of false negatives if your scanner's output is noisy. Basically if your scanner's output is really noise free, you can decrease background threshold and get better results. Turn on entropy mapping if you have lots of whites in your photos and turn off if you don't have.